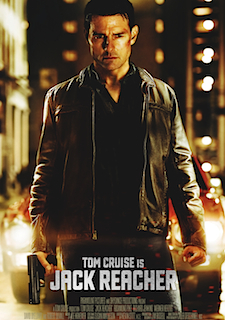 Jack Reacher is a mix of Drive, The Bourne Identity, and Mission: Impossible – with a touch of Batman Begins as Reacher disarms thugs with bone-breaking elbow thrusts. What separates McQuarrie’s film from the rest, however, is some inspired cinematography by Caleb Deschanel (Killer Joe). Deschanel creates an agonizingly tense opening sequence that would make Hitchcock proud. We witness the crime through the killer’s crosshairs. By forcing the audience to accept the perspective of the killer, we see every detail of the act – and when the gunman breathes in to steady his aim, we hold our breath as well. McQuarrie and Deschanel show us something that Lee Childs doesn’t in his book: the face of the killer is different than the man in custody. 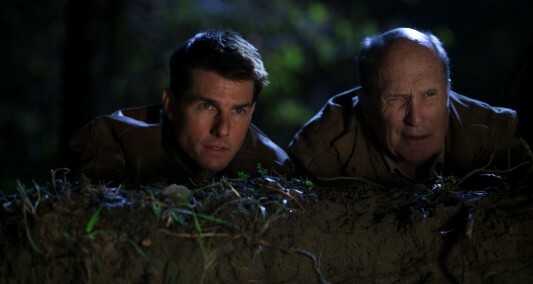 James Barr has been framed for reasons we don’t understand – and Jack Reacher is the only man who can clear his name. Refreshingly, the film takes its time laying out the groundwork as far as characters and conspiracies are concerned, making for a rather engrossing whodunit and another solid starring vehicle for Cruise. While co-stars Rosamund Pike, Robert DuVall, Richard Jenkins, and David Oyelowo turn in entirely solid, entertaining performances, it’s Cruise and Herzog who make the biggest impression as true survivalists who live by a different code. Jenkins plays the District Attorney, attempting to prosecute Barr while Pike plays the sniper’s defender – who just so happens to be the D.A’s daughter. It’s an interesting twist, forcing the viewer to consider the ramifications of conspiracy and behind-the-scenes politics while Cruise takes his shirt off and beats the crap out of people. Jack Reacher isn’t the slow-burn espionage film that Tinker Tailor Soldier Spy is, nor is it the balls-to-the-wall action flick that Jason Statham has made a career of – but it is a smart pulp thriller from another era, more akin to Steve McQueen’s Bullit than modern shoot ’em ups. If you dislike Tom Cruise, I doubt Jack Reacher will change your mind – but for those who buy into the star’s charisma and commitment to his roles, Reacher is a solid popcorn movie during a holiday season filled with depressing musicals and foreign dramas.